DB2 UDB for z/OS Version 8 (DB2 V8) introduces a large number of new features that provide for unmatched scalability, availability, performance, and manageability to reliably handle any information needed in SAP solutions. The objective of this IBM Redbooks publication is to identify the new features of DB2 V8 that are particularly beneficial to SAP and to describe how SAP applications can take advantage of these new features. While some of these features can be exploited transparently by the currently available versions of DB2, for some others the next technological release of SAP will be required. The book introduces the new features and provides real-life examples from SAP to demonstrate the usefulness of the new features for SAP and to show how SAP can exploit them. The considerations within this book apply to the whole spectrum of business solutions within the mySAP Business Suite, such as mySAP ERP and mySAP Supply Chain Management. These solutions share the common technical application platform SAP NetWeaver that includes the SAP Web Application Server and SAP Business Information Warehouse. While this book specifically investigates the new features of DB2 V8 in the context of SAP, the majority of the considerations also apply to other enterprise packaged applications. The reason for this it that from a database management perspective, these applications have many similarities, such as a strong usage of dynamic SQL and a large number of database objects. 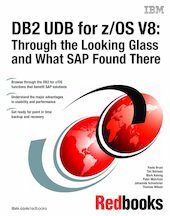 For a more general description of the new features of DB2 V8, see DB2 UDB for z/OS Version 8: Everything You Ever Wanted to Know , ... and More, SG24-6079.